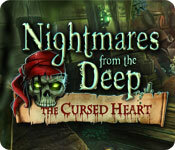 Nightmares from the Deep: The Cursed Heart is rated 4.7 out of 5 by 160. Rated 5 out of 5 by NamelessJoe from Excellent Smithers ... Simpy Excellent ! I bought this 1/2 off ... The Big Fish could have gotten full price from me and I would have been happy. Fish: You snooze, you lose. Excellent Graphics, Sounds and Animation. Some of the puzzles can be tough. Lots of fun-filled days with this one. Hurry up Bubba ... before the Big Fish raises the price !!! Rated 5 out of 5 by LaSola from Buy this game; you won't be sorry! Great story-line, excellent graphics and sound. Long game with lots of HOGs. Hints recharge rapidly. Best game I've bought this year!!! Rated 5 out of 5 by sakuradawn from From one of my favorite studios This game is the one that made me fall in love with Artifix Mundi. 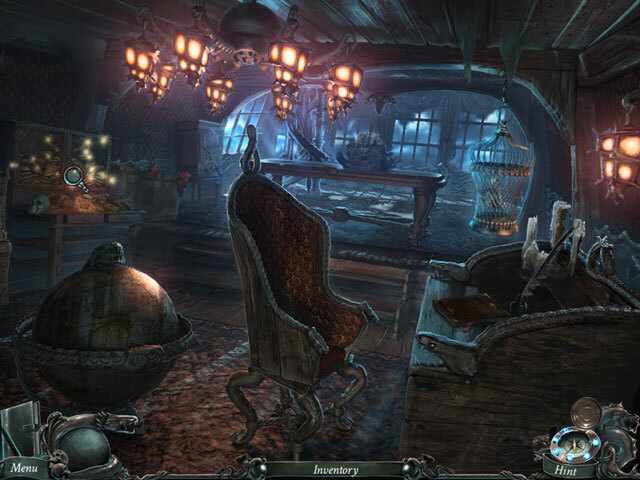 It has the perfect amount of hidden object scenes mixed with adventure style find the object put object together use object type game play. The cut scenes were absolutely amazing. It even had a small jump/scare factor here and there. I loved this game so much I've got the whole series. Rated 5 out of 5 by mouser9169 from Great game, SE the way to go on this one. This is copied and edited from my review of the Collector's Edition. This review is based on a complete playthrough of the game and bonus content. First, the CE Stuff, so you know what you're missing getting the SE: The bonus chapter took a little over an hour, and was basically a short epilogue to the game - a lot of HOS and a few puzzles, no real story. The main game ended conclusively, this just added the obvious details and a whole lot of HOS to play. No morphing objects, no achievements, no collectibles. Some wallpapers, concept art, and you can replay the game videos and HOS (but not the puzzles). I'm rating this game in 2014, so I have to judge it by 2014 standards, and the bonus comes up weak. Now the main game: You start off with a 'choice of evils' before you even start: Do you want glints or a misclick penalty? A motion-sickness inducing misclick penalty I might add. Fortunately, you can play mahjong instead of the HOS, so that's what I went with. The mahjong layouts were surprisingly good, except that some were unwinnable without a reshuffle (shuffles automatically when out of moves). THE GOOD: The game took me more than five hours to complete, even with more than a few hints along the way. The story starts up right away after a brief 'normal' introduction (the old 'fairy tale' pattern). Quite a bit of 'creep' as well, though that wore off as the game went on. Maps (which you find) show your location and where active tasks are. No transport. Your journal lists the main events and tasks, but is pretty hit or miss with a lot of the smaller things: some get recorded, some not. Graphics and video were great. They went with a 'cartoonish' CGI type thing rather than live actors, and it worked well - blended right in with the rest of the game. The sound never got grating, which is really all I ask of a soundtrack. Just background music and sounds to set the mood. Voice acting was spot on. There are a lot more HOS (or mahjong) than puzzles, and even fewer inventory items. 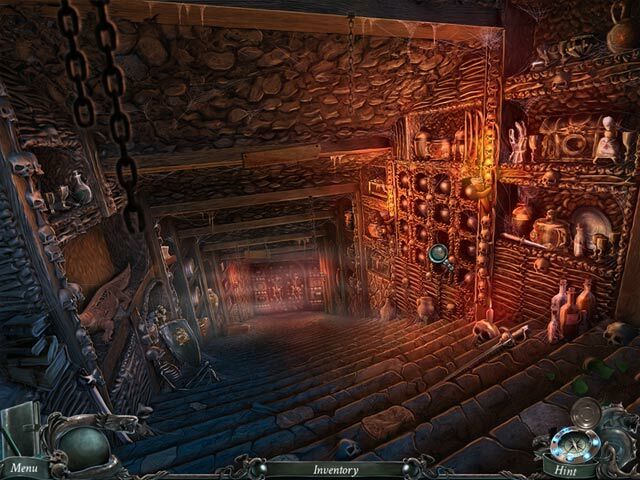 So it's primarily a hidden object game, but with enough puzzles and 'adventure' to justify calling it a HOPA. THE BAD: The layout of the maps is VERY linear - basically a long "hallway" with a couple side steps here and there. You travel this route a LOT going back and forth between 'tasks' and scenes. A little more creativity to make a more 'branching' map would have done wonders for the game. Even in Expert mode the HOS have sparkles. THE UGLY: No bugs, the hint worked, everything ran the way it was supposed to. BOTTOM LINE: The main game has it all. Solid five star game - nearly perfect. The bonus chapter doesn't add any real story elements so you can go right to the next game in the trilogy (just imagine the obvious continuation / ending). In 2014, the CE isn't a bad game (I didn't feel cheated for getting it), but it doesn't bring enough to the table - morphs, collectibles, achievements, etc... compared to what we get now, IMHO. Hale and Hearty recommendation, mateys! Rated 5 out of 5 by peppertink from Great Adventure This was one of the best adventure games I've played. Great graphics, music and storyline. Very atmospheric, a game to lose yourself in. The storyline was interesting, moving and unfolded logically, never losing track. There were several moments that were so startling, I genuinely jumped! Two maps made finding your way around and knowing what to do fun instead of frustrating. I'm glad there is a sequel. Highly recommended. Rated 5 out of 5 by Plientje from Great game!! I loved this game! The gameplay is smooth and logical, and the story is told in the most original and great way. Beautiful graphics, good puzzles and nice HOS. I loved every minute of it and hope you will too! Have fun! Rated 5 out of 5 by ThisBrevity from Best. Game. Ever. Okay, so to be fair, it is in my top 3 games which are all neck-and-neck as my faves. But this is actually the oldest of the three, so that much more credit goes to it because of that!!! I know a lot has been said, and I usually reserve reviews for games that I feel are overrated or underrated based on my experience, but I couldn't help but comment on this absolute gem. First game that made me cry (and did so more than any other game I've played# - but I mean that in the best way possible. Why can't everyone have this multi-dimensional of a "bad guy" character??? Nothing in this world is born pure evil. Let's just say that the moment I played this, I swore I would play every remotely modern game by these developers #Artifex Mundi#. This is still their best, but they have others that are excellent as well. Support them! They are small but growing. I can't say enough good things about this game...absolutely stunning music, graphics, story, gameplay - everything. I have played a lot of these games, and this is quite possibly the most memorable of them all. My one gripe - I really don't like the acting for the main character #self# voice-over. 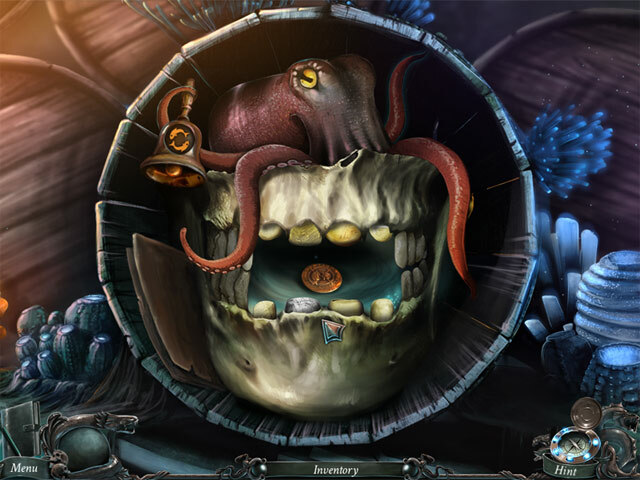 She's done others by Artifex Mundi, and I feel like a jerk for saying something, but...man, it really detracts from it for me, and I wish they would change it up. Overly obvious comments, melodramatic, and cheesy. The rest of the voiceovers are fine. Anyway, obviously it didn't bug me enough to keep it from being my favorite! Rated 5 out of 5 by crisgori from One of the best Nice graphics, well done HOS, interesting puzzles, length and a good amount of backtracking. The only complaint are the sparkles for the HOS even in advanced mode. Rated 5 out of 5 by Athena6142 from Spellbinding This game will wrap you up in the story and you will probably continue to play it til you reach the conclusion..The graphics were great, the story superb, and a fitting conclusion..All in all It's a great game throughout and also if you can't find some objects you can play Mahjong(that will get you the items you need) It is not a difficult game at all..Pure enjoyment:) If you want a game that will sweep you off your feet for 4-5 hours and immerse you in a pirate tale pick this!!!! Rated 5 out of 5 by last_one from Long play EXCELLENT game play for substance and length.